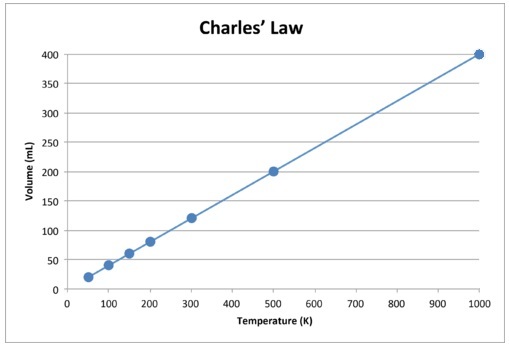 Charles’s Law is another example of one of the essential gas laws. It is sometimes also referenced as being the law of volumes. This law explains why the volume of a gas is directly proportional to the temperature of the gas so long as the quantity and pressure remain constant. The law was officially proven in the 1780’s through the unpublished work of Jacques Charles. Although this is the first time the law was proven thanks to Charles’s research, it had been hypothesized by other scientists at least a century earlier. Charles’s Law was originally published by Joseph Louis Gay-Lussac in the early 1800’s. When Gay-Lussac published the law, he credited his knowledge to research done by Jacques Charles in the 1780’s. Jacques Charles was an inventor, physicist, and balloonist that made astounding contributions to modern science. Much of his research regarding the law of volumes was connected to his deep curiosity concerning ballooning. Jacques Charles had a deep interest in the potential for flight. He diligently studied gas laws – especially Boyle’s Law (the volume of a gas is directly proportional to the pressure of a gas when quantity and temperature is kept constant). It was this law that helped Charles conceive that hydrogen could be a potential lifting agent for a balloon that would enable flight. Charles began work with Ann-Jean Robert and Nicolas-Louis Robert (commonly referred to as the Robert brothers) to create the design for the very first hot air balloon. It was a process that spanned from creating a small prototype that both mystified and terrified those in nearby communities and eventually developed into the first hydrogen balloon that was able to accommodate human passengers. After designing the first hydrogen balloon, Charles and the Robert brothers were dismayed to discover that the apparatus was very difficult to fill with air. Though they didn’t realize it at the time, their difficulty with filling the balloon to its maximum capacity was directly linked to the law of volumes that Charles would eventually discover. The hydrogen gas that was used to fill the balloon was being run through lead pipes that hadn’t been passed through cold water. Although it seems counterproductive to run the pipes containing the gas under cold water, it was the missing key that was keeping them from filling the balloon with gas. The problem was that the gas was produced in an extremely hot environment and was being transferred into an environment that was much colder. This caused the molecules in the gas to condense into a smaller volume – making it extremely difficult to fill the balloon. Had the gas in the pipe been run through cold water before being pumped into the balloon, it would have helped to ensure that the temperature of the gas particles in the pipe was almost identical to the temperature the gas would be exposed to inside the balloon. This would have helped to ensure that the gas was able to steadily inflate the balloon instead of transitioning between full inflation and partial inflation. After many years of work in ballooning and studying the nature of gasses, Charles would eventually come to make another monumental achievement. In the year 1787, Charles was working on a study of gasses (and the concept of ideal gasses) and how they responded in controlled environments. He filled five different containers with the same quantity of different gasses and then experimented with temperature. He began to raise the temperature of each gas to 80 degrees Celsius to see what would happen. As he conducted his experiment and took his measurements, he realized that all the gasses were increasing by the same amount. It was then that his theory of the law of volumes would be created. 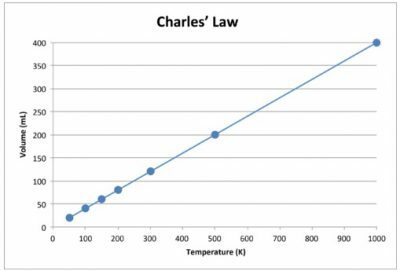 Charles’s law is an experimental gas law that helps to explain how gasses react to heat and theorizes about how an ideal gas would react to heat (or the lack thereof). The law was originally introduced by Joseph Louis Gay-Lussac in 1802, who credited the original work and proof of the law to unpublished research done in the 1780’s by Jacques Charles. When pressure is kept constant on a dry gas sample, the temperature (in Kelvin) and the volume of the gas are directly proportional. In the examples above, V is representative of the volume of a gas. T is represented of the temperature of a gas measured in Kelvin. K represents the rate constant. The first example simply expresses the direct relationship that the volume and temperature of a gas maintain when all other variables are kept constant. The second formula demonstrates the way in which one unknown variable can be solved for by using the direct relationship that is held between the volume and temperature of the same gas sample. A balloon is filled to a volume of 2.0 L at 20 degrees Celsius. The balloon is then heated to a temperature of 51 degrees Celsius. What is the new volume of the balloon? By examining the equation above, we can conclude that the new volume of the balloon is 2.21 L.
Charles’s law can be easily explained and verified using his equation to evaluate the rate constant of each gas at different volumes and temperatures. Charles’s law also explores the idea of how ideal gasses and how they may behave if they were able to maintain a gaseous state at absolute zero. It is known that when gasses are cooled, they gradually become slower and slower with their movements. Eventually, most gasses will condense back into a liquid state if they become too cold. Charles’s law, however, implies that there may be other implications for a gas that reaches absolute zero. Instead of liquefying, an ideal gas maintains its gaseous state but its molecules come to a complete rest. Although this concept is very intriguing, there haven’t been any gases that have been able to maintain their gaseous state at absolute zero. 1. A balloon is filled with 8 L of gas at 200 Kelvin. If the volume was decreased to 2 L of gas due to a change in temperature, what would the new temperature be? 2. What is the behavior of a sample of helium gas at absolute zero? 3. A balloon filled with 0.6 L of gas is kept at a constant temperature of 15 degrees Kelvin. If the temperature is increased to 40 degrees, what is the new volume?